I am becoming a “junk lady.” Since I love to upcycle, family and friends give me old stuff to see if I can create something. Well, my daughter’s friend gave me her old backpack. I used the contest as a springboard to create a pillow. One that not only used the old backpack, but added a bit of whimsical functionality. I think it would be perfect in a college dorm room or college apartment! 1. Design/Vision: Determine what parts of the backpack are salvageable. I decided to keep the top handle of the backpack and use it on the top of the pillow. Not only would it be reminiscent of the function and location of the handle on the backpack, but it would make it easy to flip the pillow from the crunchy side to the soft side. I planned to use the backpack front as the focal point. I selected a home dec fabric that coordinated in color with the backpack. Since I had a stripe, I decided to cut the front borders on the bias for visual variety. I also purchased gold tassels to add a little bit of whimsy and collegiate flair. They also tied into the yellow/gold colors in the fabric. Cut a rectangle from the backpack front. Try to find the flattest portion of the bag. I cut just outside the seam at the top. Here are the cut parts I used. Square up the edges of the backpack to create a flat and even rectangle. My rectangle is 13″ W x 17″ H. Yours may differ slightly and you will have to do the math. I typically cut my fabric the same size as the pillow form. Since this is a 20″ pillow form, My front and back fabric is cut to 20″ square. Cut the back fabric to 20″ square. Since my backpack is rectangular, I cut side and top pieces that would make the front 20″ square. This math may seem a bit confusing. If it is, simply start by adding two side pieces to get to 20 or more inches. You can always trim off the excess. To add some flair to the front and since I was using a striped fabric, I cut the border pieces on the bias. I took my remaining fabric and folded it until the side edge met the bottom edge. Using a ruler, I cut a 4.5″ wide strip on the fold. Open the fabric and cut down the center of the cut piece. I now have two 4.5″ x 17″ pieces. Using the remaining fabric, cut the 2.5″ x 20″ pieces. You can now see how the border pieces will be attached to the backpack. 4. Sew the Border Fabric to the Bag. Start with the sides. 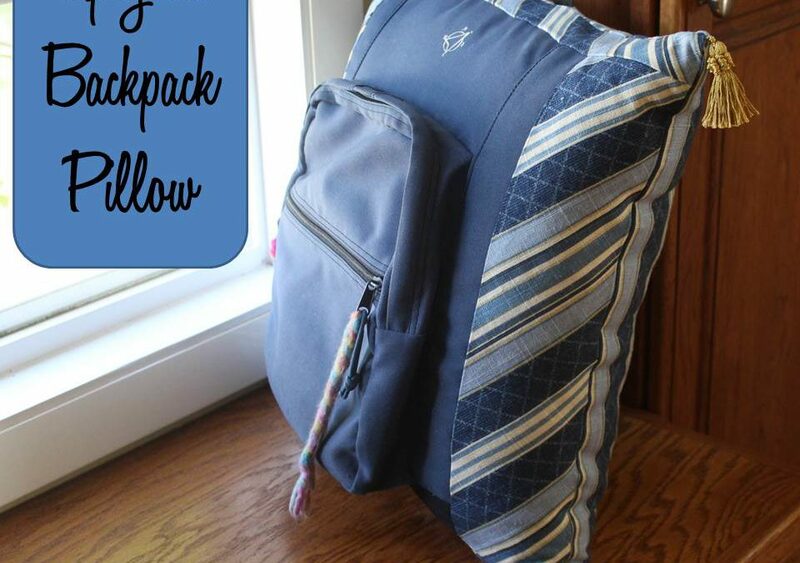 With right sides facing, sew the side fabric to the backpack using a 1/2″ seam allowance. Press. Now sew the top and bottom pieces using 1/2″ seam allowance and press. 5. Attach Handles and Tassels. Center the handle on the bag and pin. Pin tassels to the corners. I learned the hard way that it would be best to secure the tassels with small stitches before sewing the front and back of the pillow together. Or, you can sew the tassels on by hand after the pillow is completed. I thought the tassels would be held by simply stitching the pillow together but they slipped out. Stitch the tassels within the 1/2″ seam allowance using straight and zig zag stitches. Pin the front and back sides together. Starting at the bottom, sew around the four sides, using a 1/2″ seam allowance and leaving a 10″ opening. Trim corners carefully, turn inside out and press. Pin the opening closed and hand-stitch. Enjoy the pillow! As a conversation piece…. As a classy addition to the college dorm room or apartment! Use it to stash your favorite books, toys or even the TV remote! I hope you enjoyed this tutorial and it inspires you to preserve a beloved backpack in a “pretty and practical” way! What a cute idea Jane! Change the fabric to something less sophisticated and I could also see this done for a younger kid who likes to keep all their collected treasures and special little toys hidden away.